Aberdeen born and bred and now living in Melbourne Australia. Just had a load of Family belongings shipped out and my Grandfathers Imperial 66 has popped up. Dug out all his old letters he used to write to me on it and would love - pure nostalgia - to get it up and running again for old times sake. Need the ribbon though - does anyone know an easy source? Am sure they'll still be made? Many thanks in advance . . . . . I joined the Royal Air Force in 1972 and as part of our secretarial training we had to learn to type. I well remember being in a class of some 20 odd people all learning to touch-type on the famous Imperial 66. For us all the letters were covered up and we had to refer to a card at the side of the machine ... Fingers to the home keys! As a secretary at BSA Motor Cycles in the early '60s one of these was bought for me to use, the previous model having finally given up the ghost. That Imperial flew! Many years later when I left the Company I was allowed to take it with me. Electric typewriters had come in then, so my model was deemed to be obsolete. I kept it for many years, although it had little use. Eventually, after getting my first computer I finally made the decision that it was pointlessly taking up too much house room, and we took it to the local tip. With pangs of regret I remember launching it (in perfect working order) into the bowels of an industrial skip. It was like attending a funeral. John Dalby is correct, this type of spool on typewriter's is for 'Carbon Ribbon' for a cleaner,clearer finish. In the days of the 66 it was an option extra and as you see is an addition to the out side of the machine. By the time electric machines like the Imperial 770 'carbon ribbons' were the standard and fully built into the body of the machine. I actually still have an Imperial 66 typewriter! I have carried it with me since I was 18yrs old when I worked in the Office Equipment Dept. of Joseph Lucas in Birmingham, UK. I bought it because I loved it so much having learnt to type on it. I am now 61 and it has travelled the world with me and now residing in Australia. Ahhh yes, ...the great 66, not made in 1966, but made in 1961... not too sure how that figures but for me this is an amazing example of post WW2 design and engineering. Personally I would like to see a �3,000 price tag on all remaining examples. This is a fantastic machine - but for anyone thinking of buying one I would recommend that 2 people help you lift it. I totally feel machines like this will rocket in value!! - If you are thinking of buying one, buy a well made table to sit it on. Seriously: the design, its lines, its colour, its feel, its sounds - this is a great machine!! 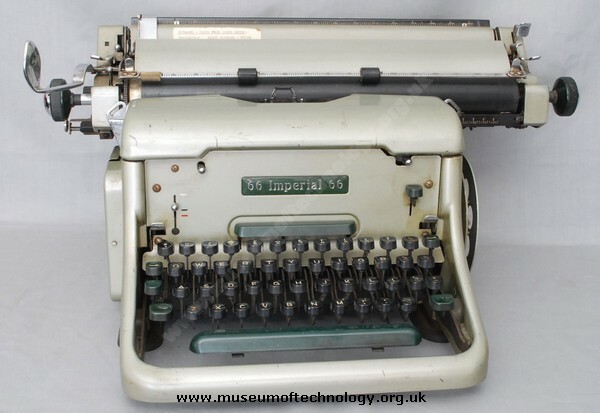 I used an Imperial 66 typewriter in my job as a secretary in 1958 in Birmingham, England. In 1957 I attended a typing class to increase my speed and the machines they used were Imperial 66's. We were taught how to clean the machine which came with it's own cleaning brush set. It was easy to disassemble the machine in order to clean it. As a performance machine. I loved it. It was sturdy and turned out excellent work. I used several other typewriter brands over the years, my first being the Underwood 5 machine. If properly maintained it was a very fast machine but I did like my Imperial 66 more. I had an Imperial 66 (without the tape attachment, and with a green paint job) for some of my time at junior school in the early 1980s. It was a bit of an awkward machine at times, suffering belt drop which my father said was a common problem with them, but which my headmaster blamed me for. It also failed to reverse the ribbon properly at least twice and I had to manually finish pushing the lever across to complete the reverse. The 66 was introduced in 1955 and discontinued in 1967. I also had an Imperial 70 at assessment school, and the junior school also had an 80 and a 90, which on the rare occasions as a 4th year that I actually needed a typewriter, I was allowed to use - the "bad" headmaster had left by then. I have no idea of the dates when the 70, 80 and 90 were produced, apart from the fact that all production ceased in 1974, with Litton winding up the Imperial business in 1978.